To begin with, you do not need to have any knowledge of web technologies; take your time and you are only a few clicks away from creating the perfect online store. First of all you can create your logo, directly on the theme, pick out the right font from over four hundred, and then choose its colour, also the background colour and the colour of the buttons. Actually, the number of colours is unlimited. On the other hand, if you wish, you may as well choose one of the twenty ready designs for your online store. Besides you can easily change the font and size of all of the written content on your site. Additionally, the theme is translated into five languages, which makes it really easy for customers of different nationalities to view your online shop and buy your products. Another advantage of the template is that it allows not only registered users to your site, if a person wishes, they may enter and purchase as ‘guest’. Furthermore, if you encounter any difficulties while using the theme, help is close at hand. Additionally, you may choose the enlisting of your products – it may either be in grid or list style. 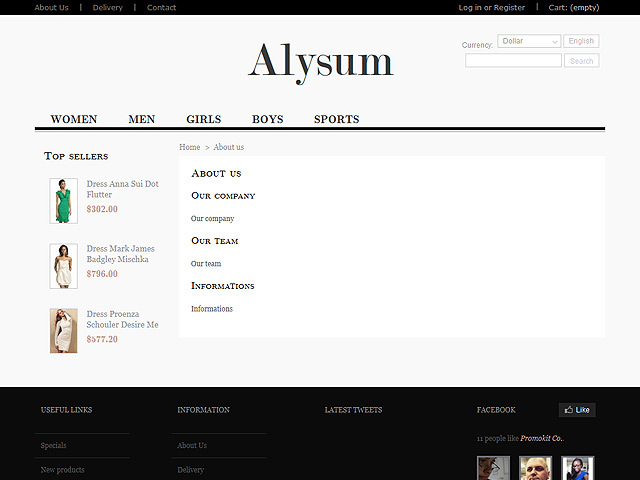 The Alysum theme is the perfect template for creating the online shop that will impress and attract customers. Last but not least the Alysum theme offers a lot of theme modules – among them are: the Block Nivo slider with a category for special products, the Product carousel, a Block Megamenu for representing all of the elements of your online shop, a newsletter block with promo and social networks and a Theme Settings module, to name but a few.